Andrew Jackson is a big, run stuffing middle linebacker that weighs in at 260 pounds. He has been an All-Sun Belt selection the last two years. Jackson had 109 tackles as a sophomore and 122 tackles as a junior. He is the prototypical 4-3 middle linebacker that is a dominant force for the Hilltoppers. Jackson is a stout run defender who is strong at the point of attack. He is a downhill player that isn’t great in pursuit, but shows good hustle. What he does well is filling gaps on the inside running game and arrives in a bad mood at the point of impact. Jackson is a good form tackler and wraps up well. He is likely not a 3 down linebacker and will probably be removed in obvious passing downs. Trey DePriest is the third Crimson Tide linebacker on our top five list. He is beginning his second year as a starter. DePriest was second to C.J. 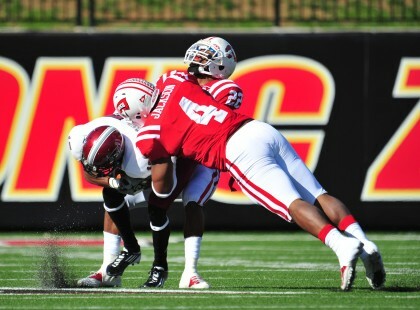 Mosley with 56 tackles in 2012. He is a strong player, that likes to take on blockers and does a good job separating himself from blocks. DePriest has decent athleticism, but lacks great speed. Coach Nick Saban suspended DePriest for a week due to unspecified team rules, but he is back with the team now. This is something that NFL teams will investigate, but if DePriest changes his ways, it shouldn’t affect his draft status. Lamin Barrow has the versatility to play on the outside or inside. With the Tigers losing Kevin Minter to the NFL, it was believed that Barrow would move inside. However, I recently read that Barrow may stay on the outside. Either way, Barrow is a talented linebacker that finished just behind Minter with 104 tackles last year. Barrow is likely a better fit as a weak side linebacker at the next level due to his speed and quickness. With so many players lost to the NFL, the Tigers will be asking Barrow to step up and be one of the defensive leaders. If Barrow stays inside, he will need to work on his tackling technique and do a better job of wrapping up ball carriers. Max Bullough is a third generation Spartan and second generation Spartan linebacker. His grandfather was a guard in the 1950’s and his dad was a linebacker in the 1980’s. He is starting his third year as the starting middle linebacker. Bullough is an old-school throwback linebacker. He makes tackles sideline to sideline, but he also has the strength and toughness to step up and fill holes in the inside running game. Bullough is smart and instinctive and hard to fool. He isn’t extremely athletic and he isn’t very fluid in space, but you won’t find anyone that will out-work him. Shayne Skov is the unquestioned emotional leader of the Cardinal defense. Skov was the team’s leading tackler in 2010, but he suffered a knee injury in 2011 and missed 9 games. He was suspended for the first game last year for a DUI, but he played the final 13 games and led the team with 80 tackles. Skov does a good job reading, reacting and stuffing the ball carrier. He has the ability to clog the middle, but still make plays in space. The Cardinal plays a 3-4 defensive scheme and Skov does a good job blitzing up the middle. Skov moves well in traffic, avoiding blockers and making plays. He drops well into zone coverage, but he isn’t great at man to man coverage. NFL teams that play a similar defense, will love Skov as an inside linebacker. This entry was posted on August 26, 2013 by draftmaniacs in Uncategorized and tagged 2014 NFL draft, Alabama football, Andrew Jackson, Andrew Jackson Western Kentucky, Cardinal football, Crimson Tide football, Lamin Barrow, LSU football, Max Bullough, Michigan State football, NFL, NFL Draft, Shayne Skov, Spartan football, Stanford football, Trey DePriest, Western Kentucky football.